Ugh. I haven’t even baked this pie, and I already hate it. First, a disclaimer: I am a white, Southern man with ancestors who fought for the CSA. Three-quarters of my blood comes from North Carolina and south, dating back to Revolutionary times. (The other from Illinois.) I grew up eating sweet potato pie, home-grown, -picked, -canned green beans, and cornbread cooked in an iron skillet. Over my 43 years, I’ve spent less than three of them north of the Mason-Dixon. Basically, I’ll put my Southern bona fides against anyone’s. And like Patterson Hood, I recognize being Southern is a complicated dance of cognitive dissonance. But I work in Charlottesville. I know that statue of Lee was probably put up to remind blacks “of their place.” The rebel flag was added to state flags in protest integration. And as a culture we haven’t confronted the enormity of everything that went down over the centuries. So, I’ll address the name of this pie. It’s named after the president of a bunch of traitors, who lost a war defending their right to own other people. Jefferson Davis Pie. I honestly cringe when I type that. So that’ll be the last time I do. Jesse Farrar at Deadspin has a lovely little write-up about him and the pie. The pie, like so much Southern food, is attributed to a slave cook. (I didn’t verify the veracity of the claim, but then we’re talking about a pie named for the president of a rebellious nation based on white-supremacy so who f’ing cares.) So from here on out, I’m naming it Jule Ann pie. 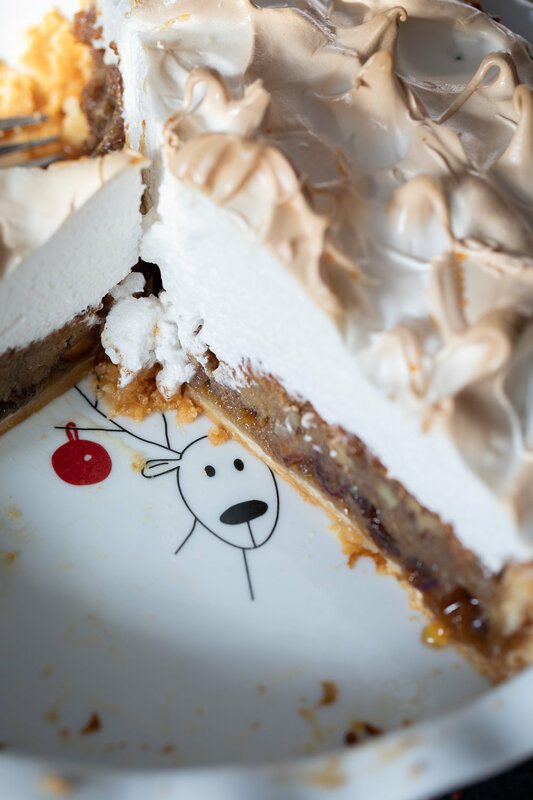 The pie itself is in the transparent/chess family—butter creamed with sugar, thickened with eggs, and made rich with some dairy. 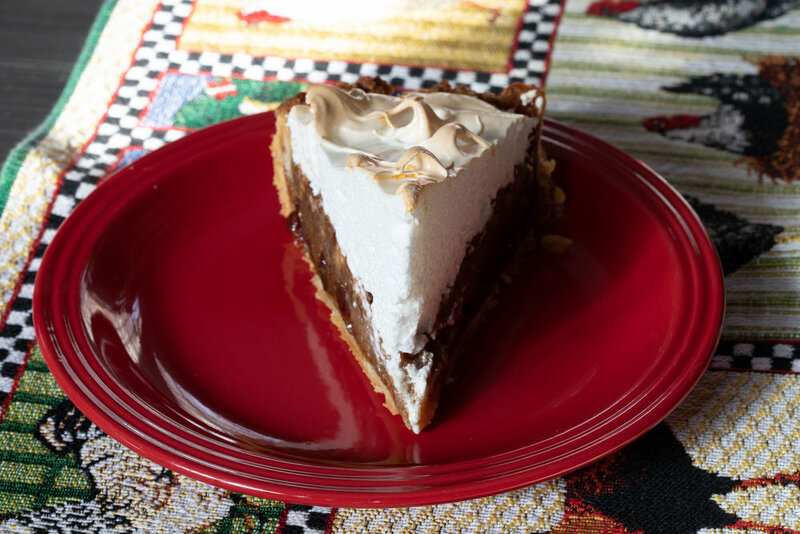 It’s akin to the pecan pie, the coconut chess, the Kentucky transparent pie. 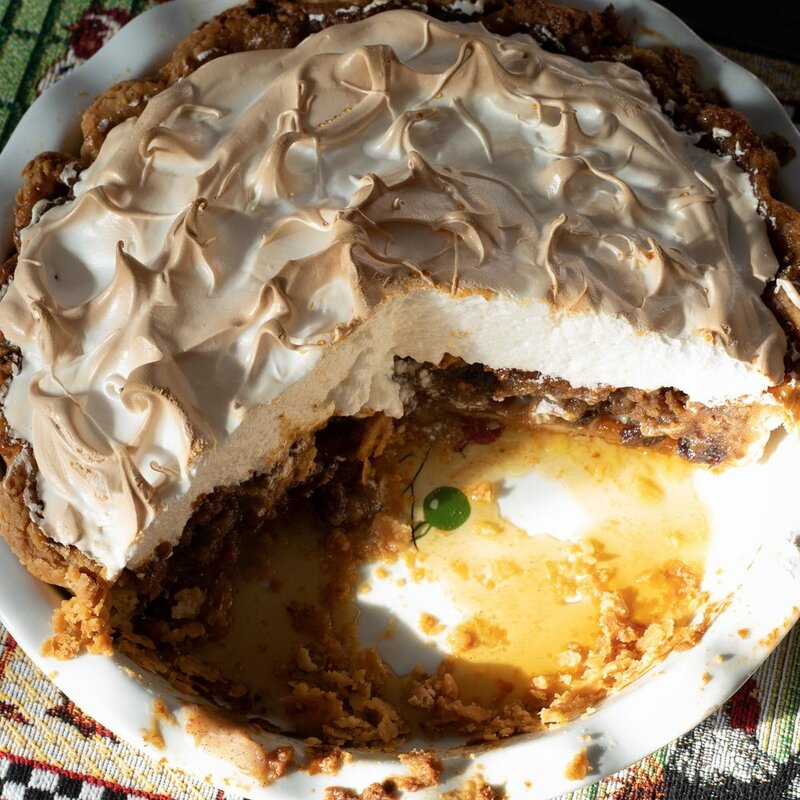 This one is a little more unique in that Jule Ann, the enslaved cook, added spices, pecans, raisins, and dates, reserved the egg whites and topped the finished pie with meringue. I haven’t baked it yet, but it the holidays, and it sounds fitting. The pie was surprisingly good. Between the dates, two cups of brown sugar, and a meringue, it was a bit too sweet. I can see making this again, but cutting the brown sugar by a half cup and doing a 1:1 meringue. It could use a little more salt, too. Also, while researching this, I came up the amazing Southern Culture, a quarterly academic journal dedicated to us. Your favorite meringue with the whites. I prefer a Swiss meringue with a 3:2 ratio of whites to sugar by weight. Lightly cream the butter, brown sugar, spices, and salt in a bowl. Incorporate the egg yolks, one by one, into the butter-sugar mixture. Stir cream into the butter-sugar mix. Fold the dates, pecans, and raisins into the filling. Pour into the blind baked pastry shell. Bake at 350˚ for 40-50 minutes till filling souffles up. The filling will firm up as it cools. Remove and cool. Once near room temp, top with meringue, toast, and finish cooling. Best with a black cup of coffee.